Categories: Renewables, Storage, Storage News. Keywords: battery, Storage. It seems there are three inevitable laws of nature: death, taxes, and power outages. The latter of those three may not belong next to the other two, but every person in the United States can think of a handful of times they were without power. 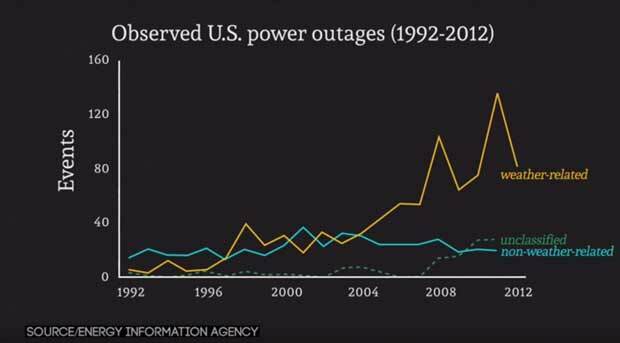 Blackouts and brownouts are becoming more commonplace in the United States. Power outages often result from too much stress on the grid, the failure of our plants and/or substations, or destructive forces of nature taking their toll. With these failures in mind, more battery storage solutions have been hitting the market, hoping to change the way we all view and use energy. Battery storage is a technology that allows buildings to store energy during low demand hours, and then use that stored energy during peak demand hours. Battery technology has made incredible strides due to what is being called ‘The Battery Revolution’; a heavy investment in battery storage technology has led to solutions that cover all users. Everyone, from utilities to the individual home owner, has something to gain from battery storage. With their large populations and ‘never asleep’ demands, cities are often viewed as the biggest energy drains to the grid. Demand Energy, an intelligent energy storage solutions provider, has been implementing a battery solution that ‘could change the way cities of the world consume power’. In the video below, ThinkProgress simply details how Demand Energy’s solution works and highlights a case study of a luxury residential building that is already using the battery solution. Categories: Latest News, Storage, Storage News. Keywords: Li-ion, Lithium-ion, Microgrid, Storage. Li-ion system costs currently range between $350 and $700/kWh ($1,000 and $2,000/kW) and costs should continue to fall on the back of growing supply from mega battery factories from the likes of Tesla, Alevo, Sharp, LG Chem and Panasonic, and promising growth in electric vehicle sales, the report says. Technological innovation and economies of scale backed by big balance sheets are helping leading Li-technology battery manufacturers to widen their competitive advantage and lower costs. Li-ion battery system prices have already dropped 33% in the last five years, according to Energy Storage Update’s analysis of recent utility evaluations, and are expected to continue to fall. Similarly, a recent report by Lux Research estimates that frontrunners such as Panasonic could drive down the price of Li-ion battery packs for electric vehicles by 35% to as low as $172/kWh in 2025. However, only the best-in-class players will achieve that cost threshold, while others will lag at $229/kWh. Some of the benefits of Li-ion cost reduction could spill over to the stationary storage market, though they will not address added costs like land, construction and integration. According to Lux, installed stationary systems for residential and grid-scale use will hover around $655/kWh and $498/kWh in 2025, respectively. Falling battery costs are good news for Li-ion systems because batteries are the single most expensive item in a storage system, accounting for about 60% of capital expenditure, followed by power conditioning system (PCS) costs with 20%, and balance of plant (BOP) and controls costs with 10% each, according to the Energy Storage Update report. The ultra-conservative requirements of the electricity industry, with its emphasis on reliability and least cost, and dependence on highly-regulated market structures, could give Li-ion technologies an additional boost in the stationary market. “Utilities and merchant storage developers are risk-averse. They prefer to mitigate early technology risk by purchasing highly engineered systems from deep-pocket suppliers and demanding tight warranties, which include strict performance clauses and liquidated damages,” said Jason Makansi, lead author of the Energy Storage Cost and Performance Report. Though many storage technologies exist, the market-ready options for grid-scale storage technologies today are few and limited, according to the report. Besides Li-ion, all other small-grid oriented technologies have currently slowed down in their commercial efforts, are pursuing niche market and functional opportunities or are expected to remain in the R&DD phase in the short-term. Li-ion systems dominate among small-grid storage technologies with 60%, compared to 22% for flywheels, 12% for lead acid and 6% for NaS, according to US utility evaluations of 30 projects of up to 100 MW installed between 2010 and 2015 for which cost data is available (see Figure 1). Figure 1: Distribution of small grid oriented storage technologies in recent utility evaluations. Source: Energy Storage Cost and Performance Report 2015. Among bulk storage technologies, compressed air energy storage could make inroads and challenge the dominance of pumped-hydro storage (PHS), according to the report. Conventional storage such as PHS will remain a key part of the system in the long run, but increasingly it “may have operational hours cannibalized by smaller-scale, Li-ion technologies that can be aggregated to provide a similar response to grid events,” said Nick Heyward, project director for Smarter Network Storage at UK Power Networks. Non-pumped hydro energy storage installations were up 40% in the US in 2014, driven mainly by utility-scale deployments of lithium-ion batteries. In 2014, the US completed 180 individual installations with a weighted average system price of $2,064/KW, according to GTM Research. Over 70% of the grid-scale storage deployments in 2014 were lithium ion. “Other” technologies were second with 27%, largely due to one 16 MW flywheel project installed in 2014. Vanadium flow batteries, lead-acid batteries and sodium chemistries each added 1% to the technology pie. The significant share of Li-ion batteries in the current pipeline of installations suggests that Li-ion technologies will continue to compete effectively against other technologies in the short term, Heyward told Energy Storage Update. “This provides increasing reassurance of integrator experience and repeatability of installations, which creates a virtuous cycle with customers – more megawatts on the ground provides a good reference base for further installations,” he said. According to Heyward, in the medium and long term, there are likely to be other technologies that gain a good foothold, but the flexibility and R&D investments that are going into the Li-ion sector are going to be hard to match, provided the latter meets performance expectations and avoids safety and fire incidents. Currently, flywheels cost $2,100-2,600/kW while NaS battery systems cost roughly $3,500-$6,000/kW. The limited number of commercial suppliers means capital costs are still high compared to Li-ion technologies (see table below). Figure 2: Costs of storage options. Source: Energy Storage Cost and Performance Report 2015. There are promising developments with other battery technologies, though they are still to be tested in the open market. Earlier this year, SunEdison announced it would purchase up to 1,000 flow batteries from Imergy Power Systems for rural electrification systems in India. Imergy says its third-generation vanadium-flow battery aims to compete with lithium and lead-acid batteries at the grid scale on a cost basis, but finding markets will be a challenge. The market demand for grid-scale storage in the US is growing, especially for storage systems in the 10 MW-100 MW range, where Li-ion has proven to be the most versatile generic battery option. At least one merchant storage company, AES, is also offering battery systems in the 100 MW-200 MW range and is constructing a 100 MW Li-ion system for electric utility Southern California Edison. Particularly at the small end of the capacity application range (1 MW-50 MW), the economic evaluation will likely be among lithium-ion suppliers and how a lithium-ion grid-scale system compares with traditional options for providing the same identified grid functions/services, the report says. Normal upgrades on the grid and conventional fossil fuel solutions at existing power plants are in many cases cheaper than investing in new energy storage systems. Traditional energy storage techniques that compete with grid-scale storage range from $25-$50 per kW for putting a synchronous condenser on a conventional power plant to $1,000-$1,500 per kW for reciprocating engine/gen sets. Other solutions exist, though every competitive option is limited in its ability to solve specific grid issues (see Figure 3 below). Figure 3: Options that compete with storage. Source: Energy Storage Cost and Performance Report 2015. For detailed lifecycle cost analysis of Li-ion and CAES systems and insight into the expected evolution of storage costs, check out the Energy Storage Cost and Performance Report 2015. Categories: Energy Management, Storage, Storage News. Keywords: Storage. The last 12 months have seen considerable progress in energy storage across the United States. California’s world-leading energy storage ambitions, encompassed in the California Public Utilities Commission’s Assembly Bill 2514 (AB 2514) approved in October 2013, are now turning into projects on the ground. Elsewhere, states ranging from Hawaii to New York to Texas have all started to emerge as potential alternative markets for energy storage technology. But which one? After all, the term ‘energy storage’ covers a wealth of widely differing options. Batteries, compressed air, pumped hydro, flywheels, and others all work in vastly different ways and have different advantages and disadvantages. The kind of energy storage capability offered by a battery pack is very distinct from that provided by a pumped hydro plant. When it comes to end users, from residential customers to major utilities, some of these capabilities are bound to have higher value than others. That is important, because at this stage of the game energy storage in general remains a costly resource, so much so that in many cases it is still to be seen whether it will make sense at all. Given the early stage of deployment of many of these technologies, it is still too soon to tell which variants and applications will provide greatest value within energy storage. It is also the case that these technologies and applications may vary depending on the market concerned, on account of differences in factors such as incentives, energy mix, or even geographical characteristics. The current state of major energy storage markets in the US. The status of the major technologies being considered for commercialization. The applications that are yielding greatest value and encouraging adoption.